The YWCA Canberra Clubhouse resumed its normal programming after a successful semi-combined school holiday program with the YWCA Youth Engagement Team. As always, we are open Monday to Friday from 3:00pm -6:00pm. Any young person aged 10-18 living in the Tuggeranong region can become a member. Young people can sign up to be a Clubhouse member by dropping in at the Clubhouse (located at Richardson Primary School), or by downloading a membership form. In the last week of term two, we purchased a new MSI gaming laptop to use our Oculus Rift and Windows Mixed Reality. We have had a great time over the school holidays downloading different applications and experimenting. Now that the school term has begun, we have had a great time introducing our members to this new resource and are looking forward to playing with and learning more about it. We were able to purchase this laptop with the support from National Science Week ACT and Inspiring the ACT. We are extremely thankful for their support in providing our members with the latest technology to help bridge the digital divide in Canberra. A highlight from this week has been the experimentation with different filming techniques. Cam, who is one of our longstanding members, has recently re-engaged with us and has been expressing his interest in cinematography, especially the different equipment needed for techniques and to produce specific shots. One of these is a Camera Slider. By putting a camera on a slider, it gives you a fixed plane for the camera to move on, so you can execute smooth camera shots. Cam is looking to purchase one for his own use, however experimenting with create a ‘make-shift’ one at the Clubhouse. Cam found a chair in the Clubhouse that moved smoothly when pulled or pushed. He used some problem-solving skills to test out a few different methods to connect a video camera to the chair. He tried rubber bands and string until he found that twine worked the best. 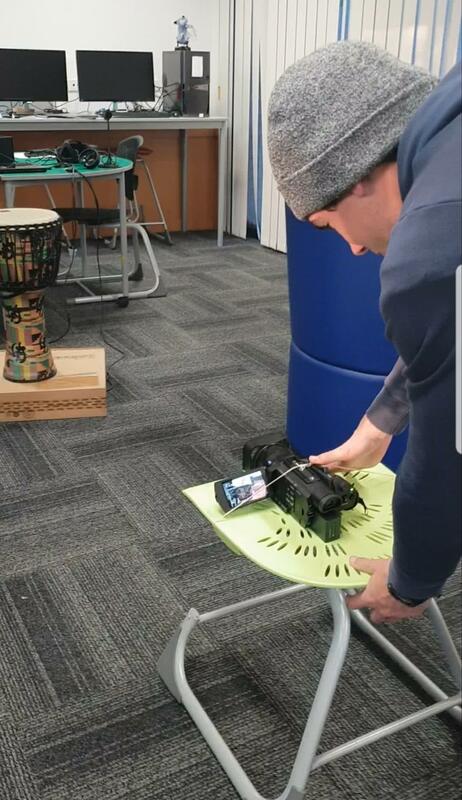 Cam secured the camera to the chair and propped up the back of the camera with some cardboard and found an object to film that would work with the height of the chair. When filming, Cam used the ‘dolly zoom’ effect, which is when objects in the foreground appear the same size throughout a shot, but objects in the background appear to morph in size. This is achieved by the camera zooming in or out, while at the same time being physically moved in the opposite direction. This technique is difficult to achieve as the zooming and moving must stay consistent for the foreground object to remain the same size. Cam did an amazing job of this and we’re excited to use this technique in a short thriller film that we are working on producing throughout the remainder of the year. Have a look at the final product!